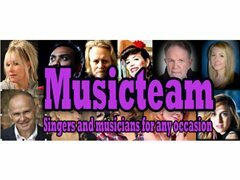 Musicteam are fast becoming the go to music agency for music in care homes and for private functions across the hwole of the UK. Recent expansion in NW UK means we require singers/ musicians with backing tracks (or guitar/ pianist/ vocalist) for occasional care home sessions in the Liverpool, Merseyside and Manchester areas. Our private clientele is also growing so you will be considered for that also. Experience working in a care home environment is desirable, must have personality and charisma to keep everyone involved and interested. 50's, 60's and 70's pop and more recent songs where requested. Knowledge of the old singalong favourites very advantageous. You must have empathy for the elderly and be able to provide suitable music content and be communicative. The work is occasional one hour sessions, we are currently heading up new marketing campaign so the right musician will generate more work. The standard of applicants is high so full repertoire is a must and experience desirable. Work varies from £40 - £70 per hour, sometimes more. Care home music sessions for Merseyside/ Manchester areas.